Please read this book and let me know what you learned from it? Perfect single shot development class. “Good” (three months of support). Advance Class. “Better” (six month of support). Master class, “Best” (one year of support). Contact us for Free evoluation of your performance. First, I won silver and gold medals in Canada and made two finals at the USAS National at my first appearance. Second, I increased the price for my class ($950 current price for the class). Someone, who is really looking for progress must make a clear decision before he will start working with me, otherwise he will lose his $950 investment. The class is good for the three following months only. Basically, I have 99% of success with my students, regardless of their age. No one is “trying” in my class! No one is treating my recommendation as an opinion! I do not need to have smart discussions or conversations about subjects that are not difficult to understand and be followed by my instructions. Handwriting is the route to your brain. 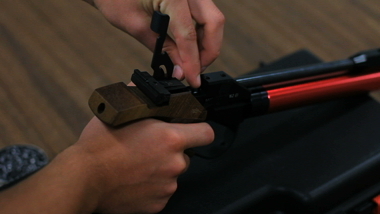 Please take responsibility to write in your shooting diary every practice session. 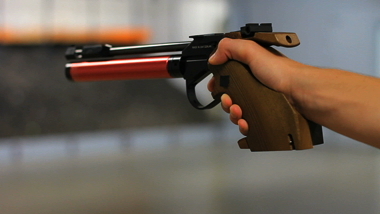 Psychology in target shooting starts with it. Please do not miss it. The difference whether you improve or not depends on you. You were able to manage your weight loss. it is good! I believe there was a certain program (structure) with your willingness (desire) to achieve new health conditions. In target shooting, you have to do similar things. Identify your weak points, create a program to improve it and force yourself on a daily basis to do those activities whether you like it or not. This is the only one way to improve your score performance. It will be more fun to do dry fire and receive benefits from those activities if you will completely understand the structure and system behind these activities. 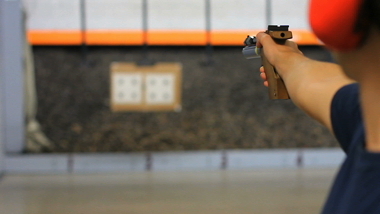 “Burning desire to work hard and be successful in Olympic style pistol, this is what I’m looking in your goal statement. I think is worth of your time to read it. by Bob Bailey and Julie Simonds On a beautiful Saturday morning in July 2007, 25-year old Jennifer Coyne boarded a charter boat for a dive in the San Juan Islands. This was to be Jennifer’s first dive since completing her Open Water certification nearly two months earlier. Jennifer contacted the shop that had certified her. They told her about an upcoming dive charter to a place called Lummi Rocks, and assured her that the dives were within her ability. When she asked about a dive buddy, she was told she would be paired up with someone on the boat. She pointed out that all of her training dives had been from shore, and that this would be her first boat dive. She was assured that there would be a staff member on board available to assist her. With those assurances, Jennifer decided to join the trip. On the way to the dive site, Jennifer was introduced to her dive buddy. John had been certified in 2000, had a total of 18 dives, and had not been diving in over a year. Furthermore, almost all of John’s prior dives had been in the Caribbean. His last cold water dive was nearly seven years previous to this trip. As the boat approached the dive site, both Jennifer and John expressed some reservations about the dive when they learned that the shop representative was an instructor who would be working with an Advanced Open Water student rather than diving with the two of them, as she had believed from the dive shop’s earlier assurances. But they were told not to worry about it, that everything would be fine. Once on site, signs of inexperience were evident in both divers. John had difficulty setting up his equipment, and told the shop instructor that his BCD was too tight, making it hard for him to breathe. Once in the water, Jennifer was unable to descend, and the boat crew slipped some additional weight into her BCD pockets. By the time these problems were sorted out everyone else had started their dive. John and Jennifer descended alone. As is typical in the San Juan Islands in July, the upper layer of water was rich with plankton, creating a bloom that made it difficult to see. They overcame their sense of anxiousness by giving each other the OK sign repeatedly as they were descending. At a depth of about 30 feet the visibility began clearing up, although it was dark and neither one of them had brought a light. John signaled that they should move across the sloping bottom toward some lights that they saw in the distance. About 10 minutes into the dive John turned to look at Jennifer, who had been swimming slightly behind him, and realized that she was not there. Turning to look for her, he saw someone in the dimness ahead and swam in that direction. As he approached, he saw that it was Jennifer. John realized she was unconscious, but doesn’t recall whether or not she had her regulator in her mouth. Grabbing her by her BCD, he attempted swimming to the surface. John was kicking hard, but not making any progress toward the surface. He didn’t think to release her weights or inflate her BCD, and in a very short time the exertion was taking a toll. John was feeling as though he couldn’t get enough air through his regulator, and he felt the onset of panic. He released Jennifer and headed for the surface. On the way to the surface, John succumbed to panic and spit out his regulator. He hit the surface gasping and choking, completely unable to call for help. The captain and mate noticed him struggling and motored over to pick him up. Unable to talk or breathe, John kept pointing down. Once the captain realized there was a problem, he initiated a recall by tapping on the boat ladder with a hammer. However, not all divers responded to the call promptly, and some decided to do a safety stop before surfacing. Precious minutes were lost until someone with rescue training was able to initiate a search for the missing diver. Jennifer was located in approximately 60 feet of water by the instructor and another diver who was rescue certified. Once on the surface and back on the boat, CPR was started. The Coast Guard had by then dispatched a boat to transfer Jennifer to shore where EMS was waiting. Jennifer’s heart was started in the ambulance on the way to St. Joseph hospital in Bellingham, where she was placed on full life support in the intensive care unit. Jennifer never regained consciousness. Three days after the accident, her parents made the decision to remove her from life support when the doctors determined that she would never have enough brain function to breathe on her own. She died on July 24, 2007. Dive accidents are usually difficult to analyze, because the facts of what occurred often die with the victim. In this case, much is known about the events leading up to Jennifer’s death. And as is often the case, several significant factors contributed to the outcome. Neither Jennifer nor John were adequately experienced for this dive. Jennifer had never done an unsupervised dive, nor had she previously dived from a boat. She was relying on someone else to guide her through the process. John had minimal experience over a prolonged period, and had not dived in cold water for several years. OWcertification only qualifies you to dive in the conditions in which you were trained. All of Jennifer’s training dives had been from shore. John’s initial training had occurred in northern California, and he had done only 14 subsequent dives in the seven years since certification. All of those had been supervised dives in warm, tropical conditions. He had not been diving at all for more than a year, and had not taken any follow-on training or refresher classes to maintain his skills. Furthermore, neither diver had been trained for a rescue situation. John was unable to assist Jennifer because he had never been taught what to do with an unconscious diver. Both divers were using rental equipment that was either ill-fitting or poorly functioning. John had complained prior to the dive that his BCDwas too tight and constricted his ability to breathe. When Jennifer’s regulator was tested after the accident it was determined to be performing well below the manufacturer’s specifications. An inability to breathe properly may have contributed to both Jennifer’s unconsciousness and John’s sense of panic as he attempted to assist her to the surface. Neither Jennifer nor John had sufficient knowledge to evaluate whether the dive fell within the scope of their competence. Both divers were relying on someone else’s opinion that the dive was appropriate. Jennifer lacked the experience to know what questions to ask, and so she trusted the dive shop employee who told her not to worry. John expressed misgivings about his equipment prior to the dive, as well as his concern about a lack of supervision. Despite this, he trusted the instructor who told him it would get better once they were underwater. Both divers decided to go ahead with the dive despite their apprehensions. There were many opportunities for this accident to have had a better outcome. The dive shop could have told Jennifer that this particular dive was not suitable for someone as inexperienced as she was. Rather than selling a charter trip to someone who had never before dived in these conditions, the dive shop could have used it as an opportunity to offer Jennifer additional training, or recommend that she hire a private guide to accompany her on the dive. New divers simply don’t know what questions to ask or how to determine that a dive they’ve never done before is appropriate for their level of training and experience. They rely on the advice of experienced mentors and dive professionals to develop and maintain appropriate safety guidelines. Providing an experienced dive guide or buddy could have made this a more appropriate dive, but without adding that element of experience, both divers should have been told that this dive was above their level of training and experience. Properly maintained and fitted rental equipment could have reduced the potential for stress-induced behavior in both divers. An experienced diver may be able to get by with a regulator that’s not breathing well. A new diver, on the other hand, will be putting significantly more effort into the dive, and putting more stress on the performance of the regulator. A poorly-functioning regulator causes a buildup of carbon dioxide in a diver’s body. This leads to a feeling of “I can’t get enough air”, and can cause a diver to panic or even pass out. Rental equipment is used frequently, and in ways that make it difficult for the shop to know when it requires maintenance. For this reason, whenever rental equipment is used, it should always be ascertained by the diver prior to leaving the dive shop that the gear fits and functions as expected. It should be understood that the last person who used it might have had a problem with the gear and failed to mention it to the shop staff when the equipment was returned. Unfortunately, rental gear is almost always used by people who are the least qualified to assure that it is functioning as it should. But the biggest issue was placing two inexperienced divers together in low visibility conditions at a site they were unfamiliar with. A prudent decision would have been that conditions were not advisable for someone at their experience level, particularly given their level of apprehension prior to the dive. It’s a difficult call to make, considering that they had paid for the dive, rented the gear, and made the trip. But making the decision that conditions were not suitable for their training, experience and comfort level would, in this case, have saved a life. There were many opportunities for either Jennifer or John to have decided not to dive. Granted that new divers may not have adequate background to anticipate the potential for an accident, but every diver needs to have ingrained in them the notion that if something feels wrong, don’t get in the water until you’ve addressed why you feel that way. Divers must be honest with themselves about their ability to do any dive safely. And finally, there is a difference in perspective between experienced divers and the inexperienced divers who rely on their advice. To an experienced diver, a site may seem easy and suitable for all skill levels … but that might not be the case for someone with little to no experience. Small issues that may seem simple and easily resolved for the experienced diver may seem stressful or insurmountable to the new diver. Before giving advice or assurances, the experienced diver needs to be careful to look at the conditions of the site from the perspective of the less experienced diver. The takeaway from this accident may have more to do with questions than with answers. How much do reassurances … however well intentioned … play a pivotal role in accidents involving new divers? How often do those of us who have done these dives many times tell the new diver who is showing signs of anxiety that “it will be okay”? And how often are we doing them a disservice by saying so? For the new diver, you need to be less trusting of other opinions and more reliant on your own. If you’ve never experienced something before, don’t assume that it’ll be okay to get that experience in the company of someone else who has also never experienced it. If it feels wrong – it probably is wrong. Take responsibility for your dive. You are the person who is primarily responsible for your safety. Whenever you get a feeling that something about the dive isn’t right, listen to your feeling … it’s trying to keep you alive. A good adage to live by is that problems on the surface neverget any better once you go underwater. Bob Bailey is a NAUI instructor in the Puget Sound area. Julie Simonds is the mother of Jennifer Coyne. Skills, Dive Planning, Gas Management, and how to choose a number of things. Including equipment, instructors, courses, and even your Local Dive Shop (LDS). well as the Indian Ocean and in the cold waters of Northern Europe.” WOW!